Auto Focus features special events in the thriving Philippine automotive industry. In this week's Special Feature, it's all about Concept One Wheels, a one-stop shop that offers different products for every car enthusiast's needs. Concept One Wheels is also home to the popular Black Rhino wheels. Find out here more about what the store offers. Watch this. Concept One's main store is located at Santolan Road in San Juan City, Manila. The store offers a variety of products that cater to the needs of every car enthusiast out there regardless of their preferences and style. Concept One mostly offers wheels, rims, tires and other products that come in different styles and designs are updated constantly. As mentioned, Saffiro Tires are available in Concept One store. These are for entry-level models; however, they are pricier than the other products. Meanwhile, customers who are after a premium quality, they would go for the Nitto brand. On the other hand, the Yokohama brand has just entered the off-roading and SUV market as it initially started catering to race cars. However, they have been developing more products for the SUV segment. The most popular product available in Concept One is the Black Rhino Wheels, as most customers now are leaning towards SUVs and light trucks like the Toyota Fortuner, Mitsubishi Montero Sport, Nissan Terra, Jeep Wrangler, and other cars that could be taken on to any adventure. Concept one has both rims and tires that are perfect for street and off-road use. Another hit product that Concept One offers is the Breyton Wheels, a brand that originated from Germany and was conceived by Engineer Edmund Breyton. The Breyton Wheels fit BMW vehicles perfectly as well as select units of MINI, Audi, and Mercedes Benz. Apart from the Black Rhino and Breyton Wheels, Concept One also sells TSW Wheels which caters to American brands as well as to some Japanese applications for the larger sedans. In addition to these lineups of wheels and tires, Concept One offers bike racks, roof racks, and other Overland Kings products, which Concept One, together with Black Rhino Wheels Philippines, collaborated with recently in offering off-roaders, adventure seekers and outdoor enthusiasts all their equipment and gear. The products are available at Black Rhino Outlet Store in Paranaque. Concept One is also open for different services. Visit Concept One store in Santolan Road, San Juan City, Manila to learn more about the products and services they offer for car enthusiasts and adventure-seekers. 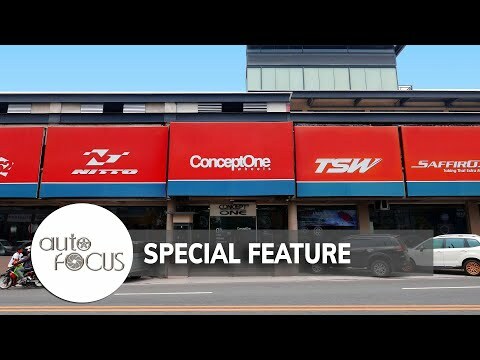 That was Concept One Wheels, a shop that has it all especially when it comes to having quality wheels, our Special Feature this week. We hope you enjoyed.